Harker’s efforts to fund its planned events center received a huge boost in early May when Chris Nikoloff, head of school, announced the school has received a historic $10 million matching gift challenge by Harker parents Jeff and Marieke Rothschild. The events center will house a theater, gymnasium and all necessary supporting facilities. Parents, alumni and other friends of Harker can have their gifts matched by making a pledge or donation to the capital campaign prior to the start of the 2014-15 school year. Pledges can be paid in as late as 2016, so families should pledge their donation, now, to qualify for matching funds, but can make the actual payment as late as 2016. Construction of the new center could begin a full year earlier than expected if the full amount of the pledge is matched, opening the building to students in fall 2016. The additional space will free up athletic and performing arts areas for other uses, including the expansion of the Visual Arts Department and the creation of the Harker Innovation Center, which will house the school’s new Business & Entrepreneurship Department. For more details, including Harker’s strategic plan and the 2020 Harker Vision Statement, go to http://www.harker.org/page.cfm?p=274. See, there, also , links to features and benefits of the planned events center. Details about the Matching Gift Challenge can be found in the “Rising To the Challenge” booklet. 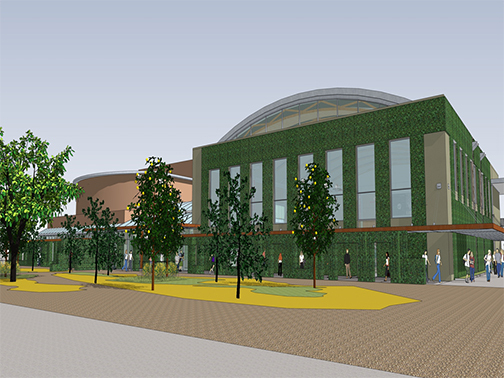 And to see a virtual tour of the new events center and to hear how the facility will enhance student life at Harker, check out “The Events Center Video,” which features comments about the project from parents, alumni, students and faculty. For more information or to discuss pledge options, please contact Joe Rosenthal, executive director of advancement, at 408-345-9266 or joer@harker.org.